All the technical details on how to make this integration with Zoom possible and the benefits to do so. Zoom is the leader in modern enterprise video communications, with a secure, easy platform for video and audio conferencing, messaging, and webinars across mobile, desktop, and room systems. Zoom helps businesses and organizations around the world bring their teams together to get more done. We are now publicly available on the Zoom Marketplace and this integration can be used even on their FREE account. The following steps will help get you setup with this much raved about integration! Head over to your integrations page in your admin area where you will see the following section (highlighted in this screenshot) when you click the 'CONNECT' button below 'ZOOM'. 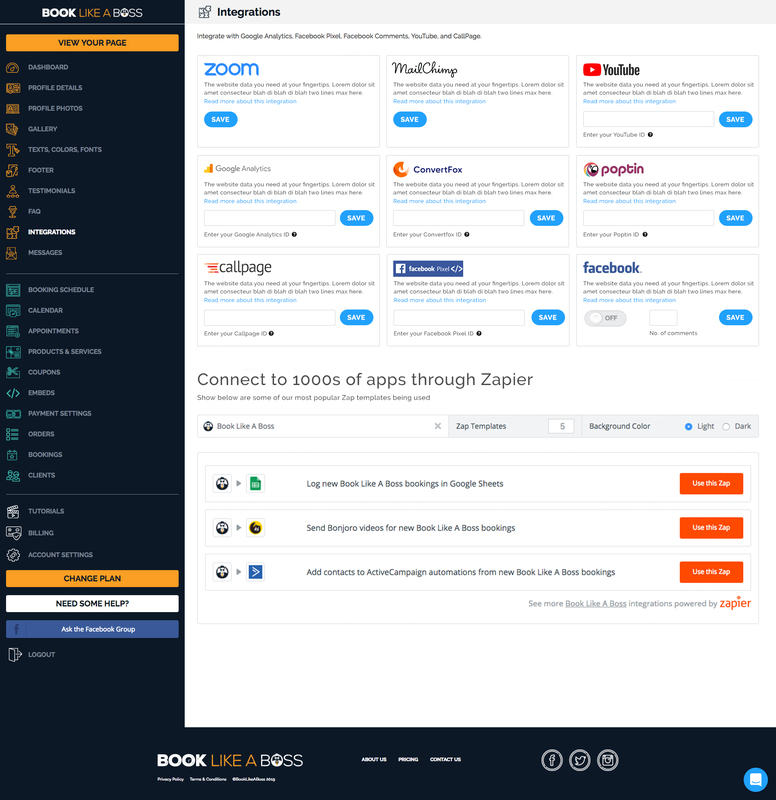 You will be asked for your Zoom username and password to make the integration with Book Like A Boss. You will be brought to this screen once you click on the 'CONNECT' button on the integrations page. Fantastic! You have now connected to Zoom. So, how do you make this integration 'work' for your appointments and services? Perhaps only some (not all) appointments should have Zoom information added? The following steps will answer these questions. Right, lets jump over to the Appointments page (or the Products & Services page depending on your needs) and click on the edit button (the pencil icon) of an existing appointment, or, create a new one. You will be presented with the following screen with a highlight shown here on the relevant section relating to Zoom. Check this box is you wish to have Zoom information added to this particular appointment. Alternatively, leave it unchecked if you do not want Zoom information added. 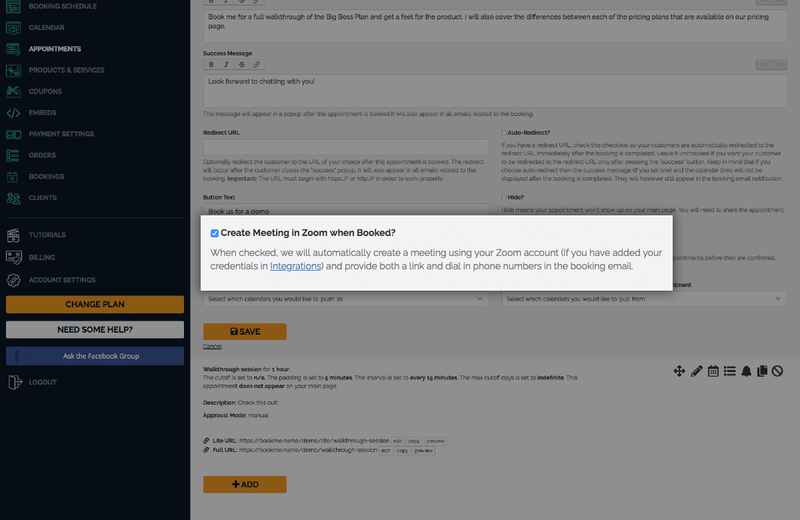 If you have a static Zoom meeting room then these details can be added to all email reminders, confirmations, etc and more information can be found in this article titled 'Can I customize the emails or SMS messages that are sent out?'. 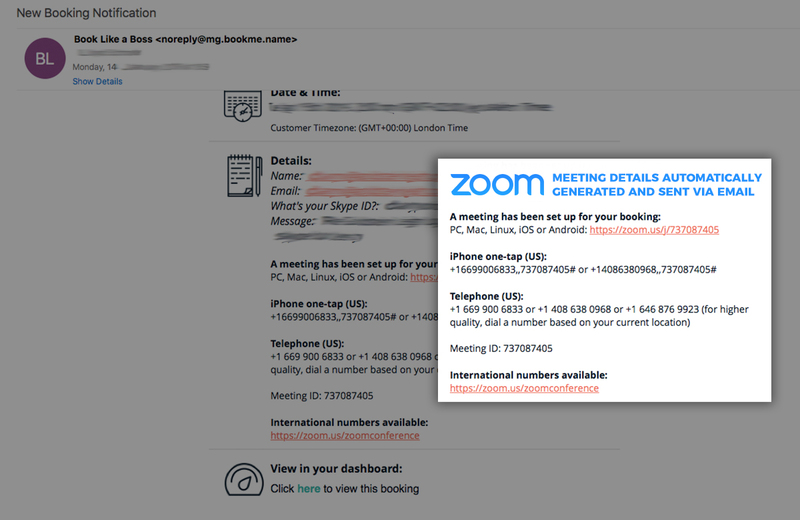 So, how do the Zoom meeting details look in the emails that go out? Please see the following screenshot below. I hope this article was informative and helped answer any questions that you may of had.